"Most everybody who landed on Omaha Beach D-Day lost something. I, for one, lost most of my personal belongings..." Cpl. H.W. Crayton, on returning a bible to the parents of two brothers lost on Omaha Beach. What an unbelievable find! These knives were actually used by British SEALs (SBS- Special Boat Service) during World War II! They have been in storage since 1945. We polish them up and put on new Fossil Ivory scales. (It takes a lot of ivory!) They are an instant collectors' item, and generate a tremendous amount of interest and excitement. Please note: These knives are collector's items and are not to be relied on in times of emergency aboard a boat. We completely refurbish these knives. (There may be some "dings" left, so don't expect each to be absolutely pristine.) The blades are 1940's vintage stainless. 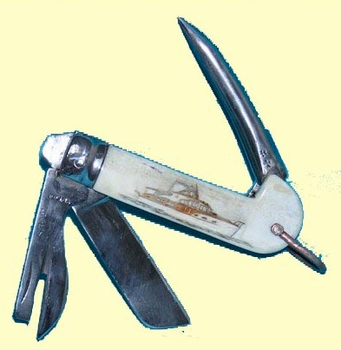 In addition to the large 3 7/8 inch blade, there is a beautifully curved marlinspike, and a 2 3/4 inch can opener. There is also a handy screwdriver at one end. Even has a beryllium copper thong ring. Of course, it comes with a zippered collector's pouch, or leather belt sheath. Included is a hand etched scrimshaw design and initials, name or date. Add a contrasting liner as an additional option. A great gift! Perfect for an executive desk, as a letter opener, or addition to a knife collection. A phenomenal conversation piece! We have only a few of these folders left, so please order early. As an option, we will scrimshaw an etching of a ship of your choice, or your own boat (sail or power)on one side - Just email or snailmail us a picture.